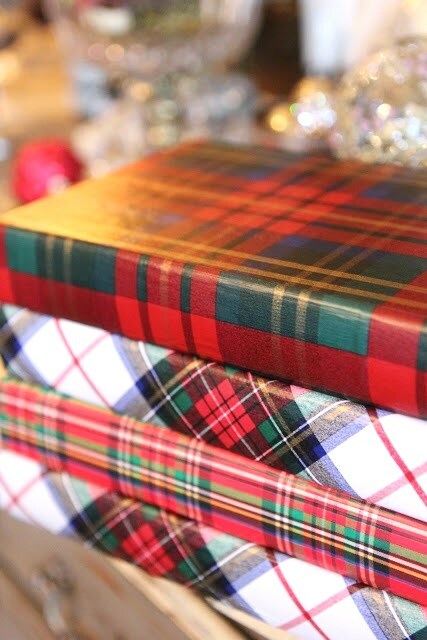 Plaid is my go-to for Christmas. I like to keep it simple, and that's what Tartan Plaid gives me. 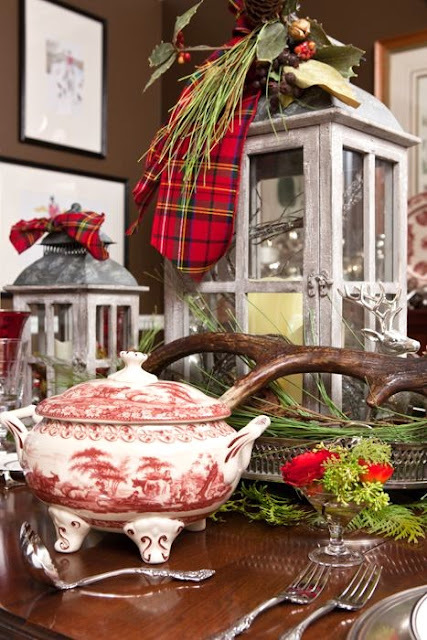 The Tartan Plaid fabrics bring an instant festive Christmas flair. 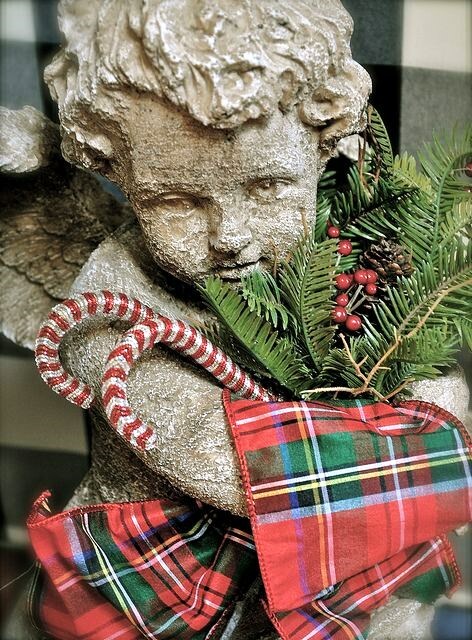 A concrete statue becomes a Christmas Cherub. 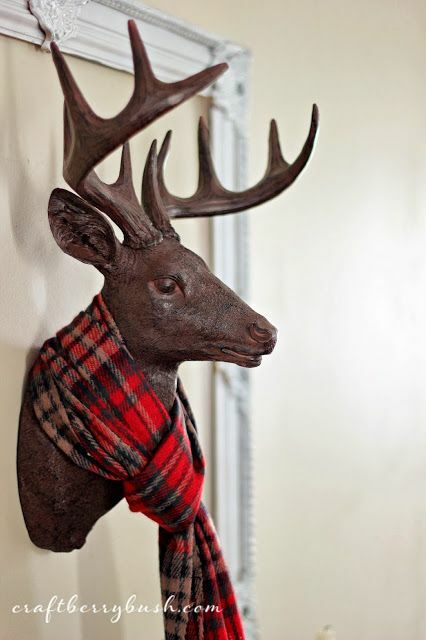 Plaid shows off a rustic and woodsy vibe. to your book covers, tabletops, and bookshelves. 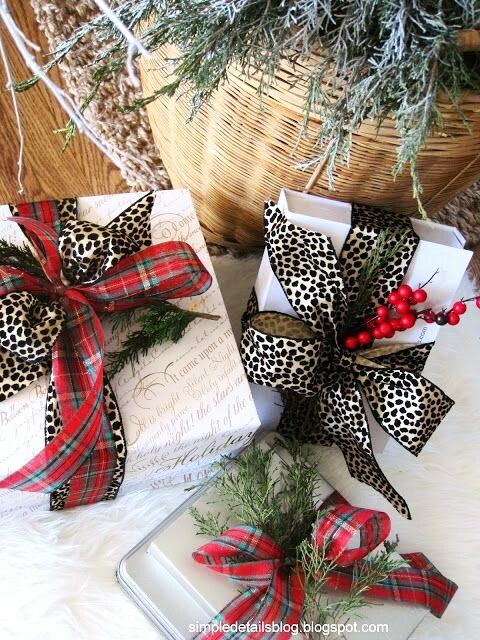 And use different plaids to wrap your gifts. 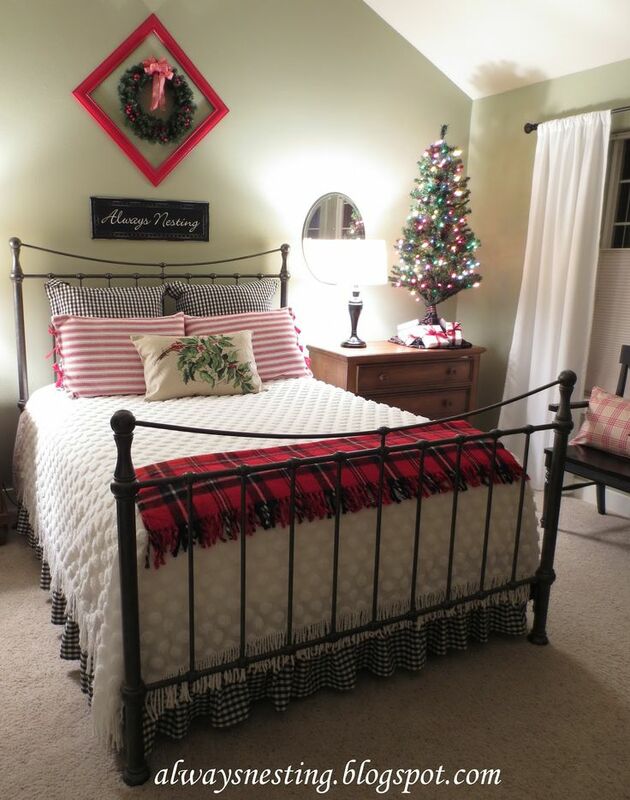 and pairs beautifully with florals for snuggly Christmas bedding. 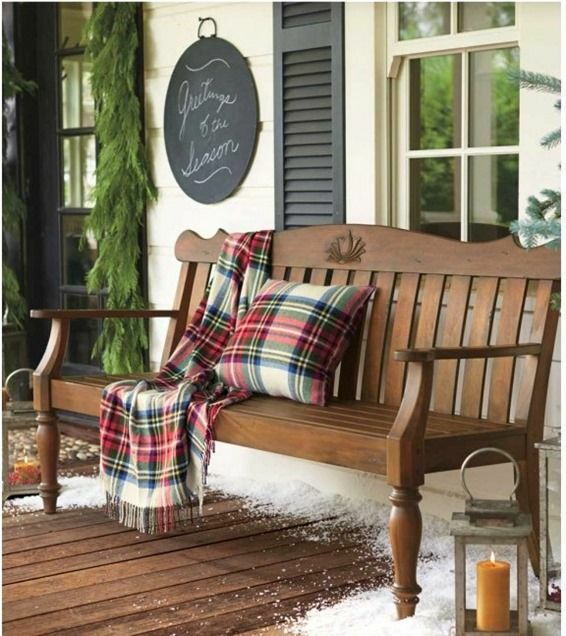 or tea time on the porch. 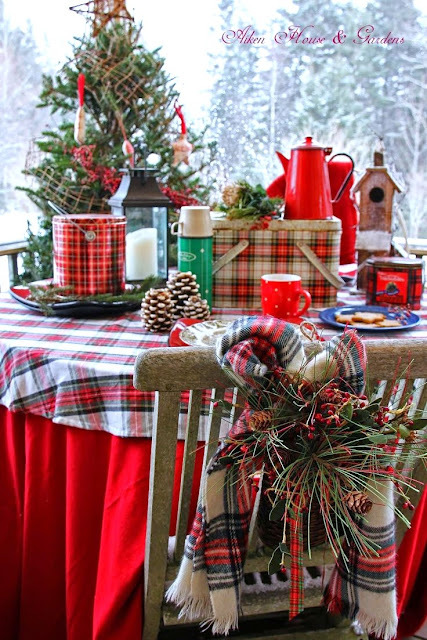 A Christmas Tablescape is the perfect place for plaid. 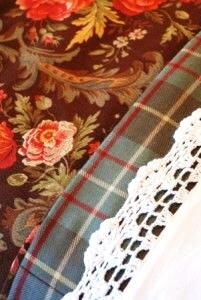 looking for something fabulous to wear? Do you love a good Plaid for Christmas? 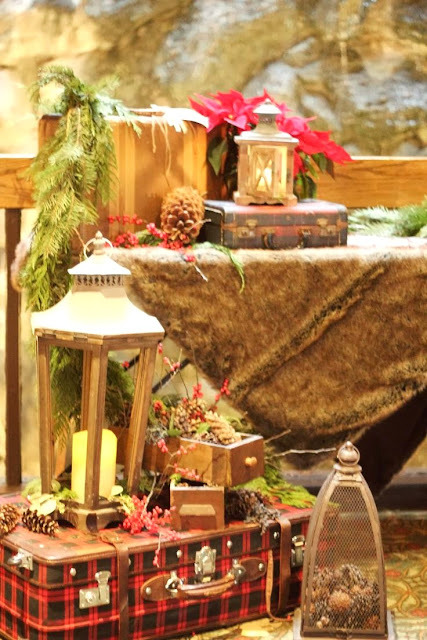 Now, can you guess what I'm doing for Christmas? I am with you! I absolutely love plaid, especially this time of year. 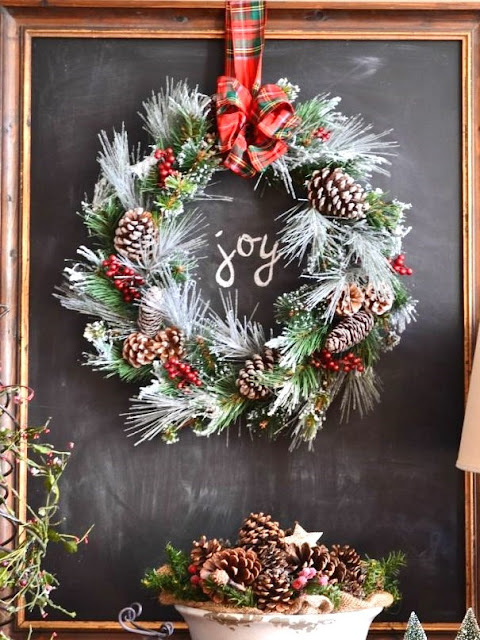 You posted so many gorgeous images that now I feel motivated to go shopping! 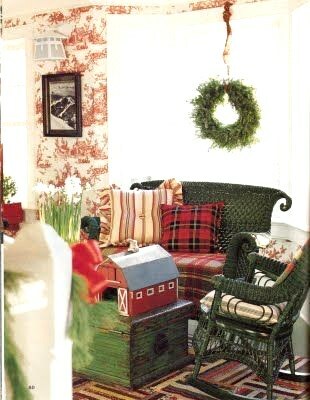 I plan on lots of plaid in my house for this Christmas season! This was an awesome post!! 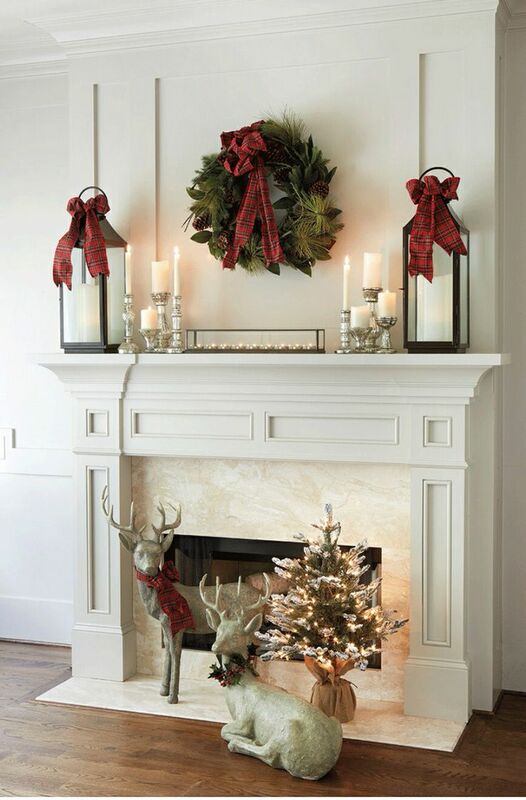 I saw so many wonderful things that made me drool - thanks for putting this together, now I'm inspired to include more plaid in my decor this year! 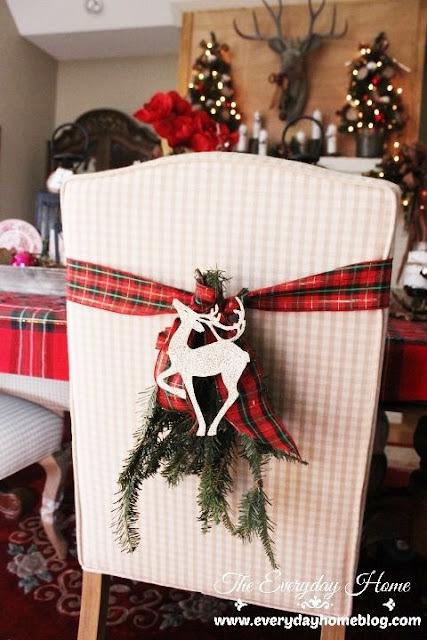 I am doing a plaid themed room this year and have been trying to source lovely plaid ribbon. So far, no luck. 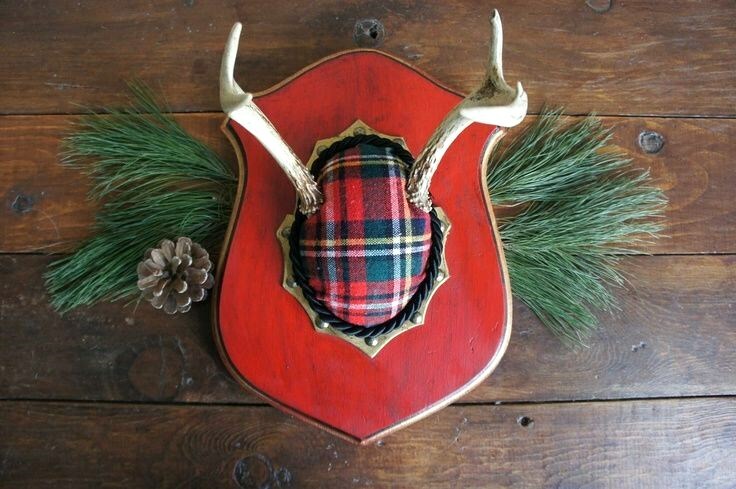 I have bought Michael's flannel offerings in the event I can find nothing else. That first picture is perfect! I love this post so much!!!!!!!!!!!!!! Yes, I love me a good plaid for Christmas and winter too!! 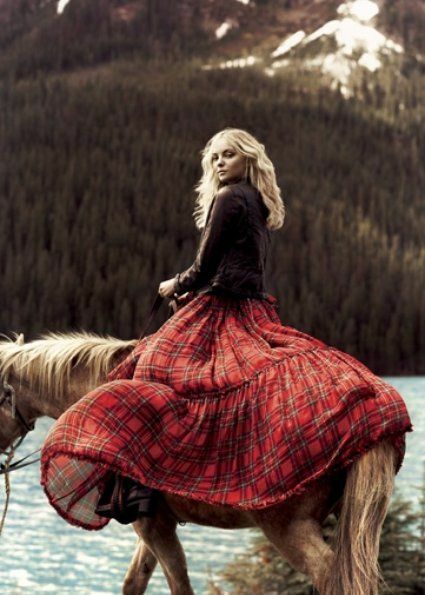 Love all your pics.....and how about the gal with the plaid skirt riding a horse.....awesome!! 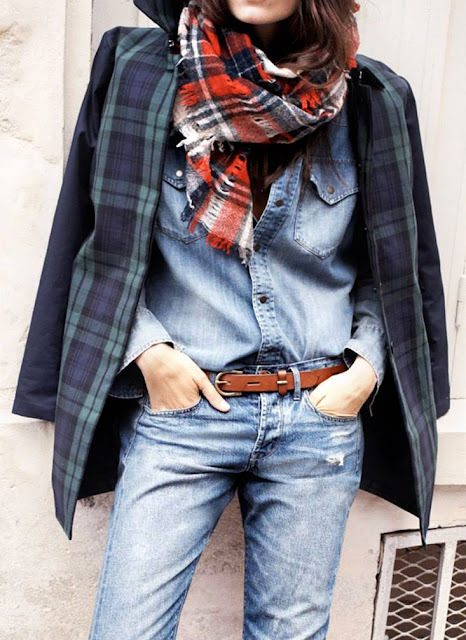 Plaid seems to be the biggest new combo. 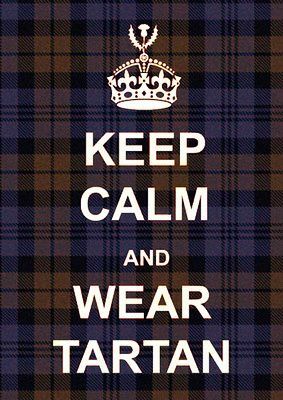 And I don't have one plaid thing in those tartan colors! Are you getting my emails? 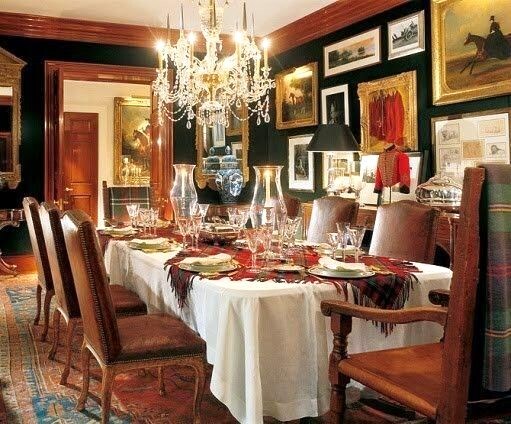 I really love the classic look of plaid too. 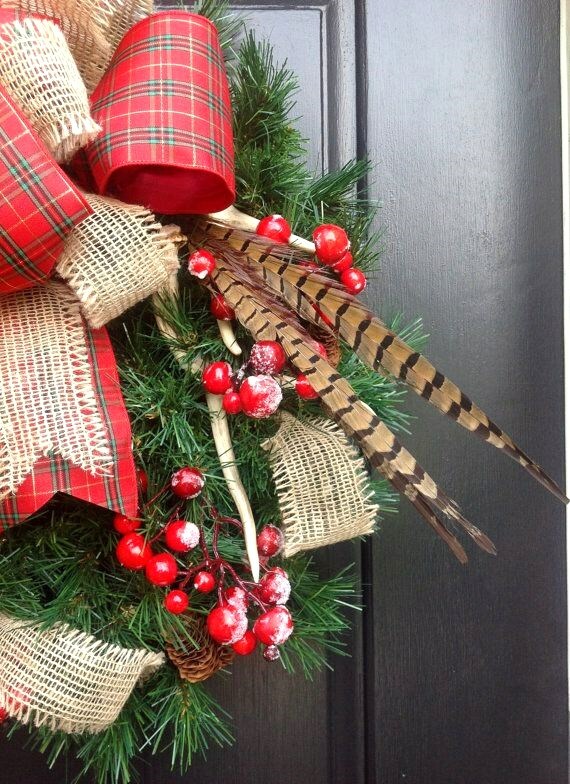 i don't decorate with it much nor do I wear it much. But I really do like it. I like it mixed with the leopard print too. I'm caught up in the entire plaid thing again this year. Love all of it. 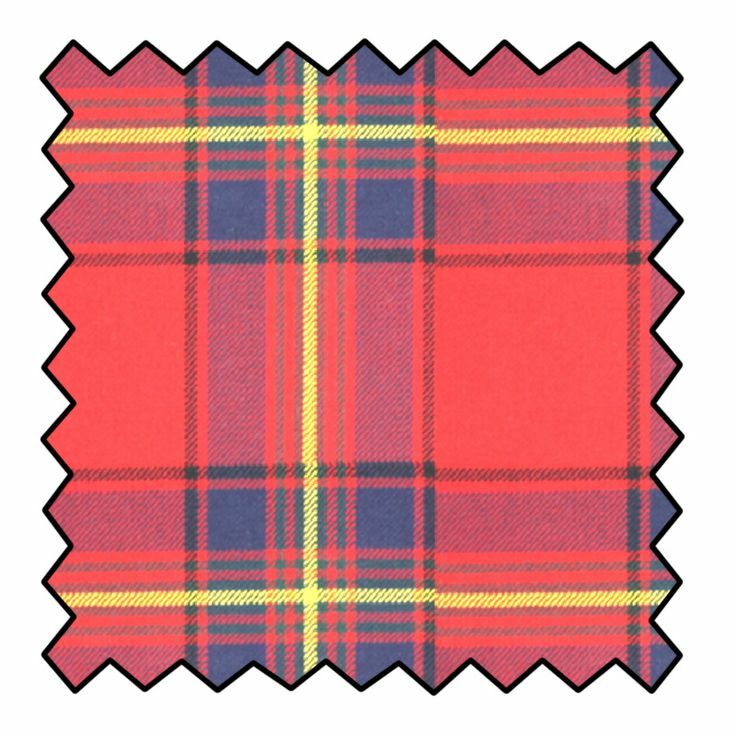 Tartans have always been in my home and wardrobe. So classic and enduring. 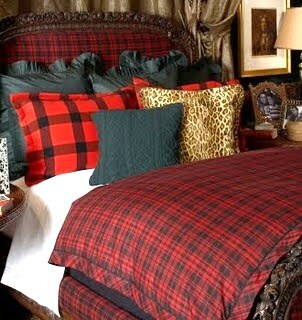 Debra, I'm a tartan and plaid fan. Loved seeing all these images. 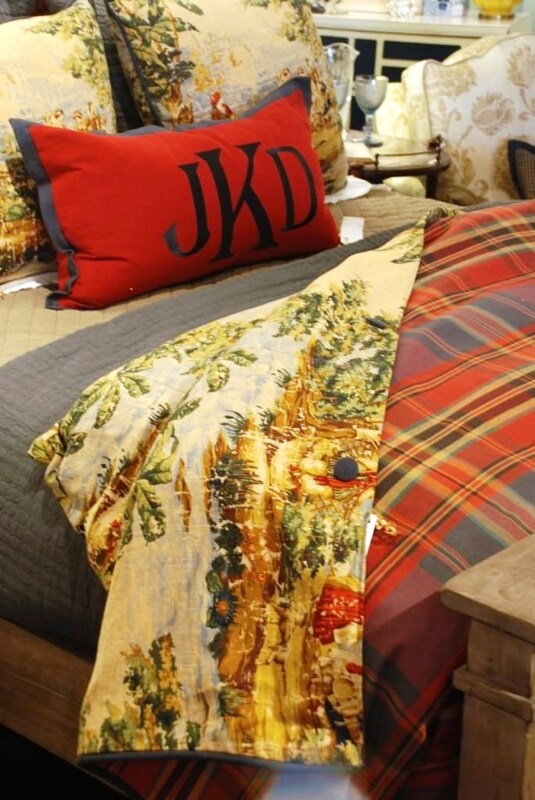 I'm crushing over the headboard upholstered in plaid with the gorgeous carved wood trim. Beautiful from head to toe, as they say. 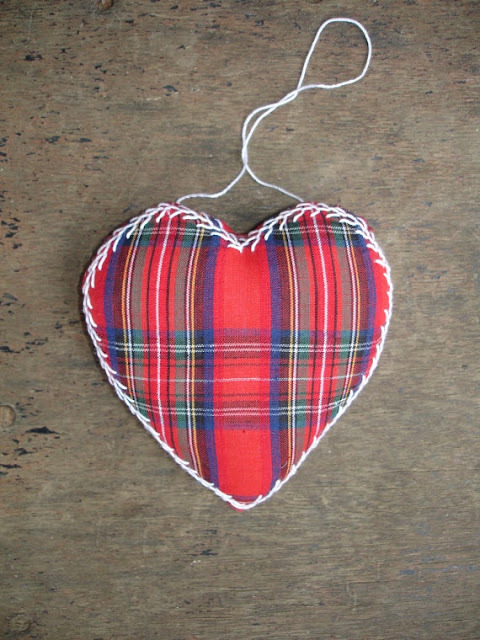 Debra, I love this post and I love tartan!!! 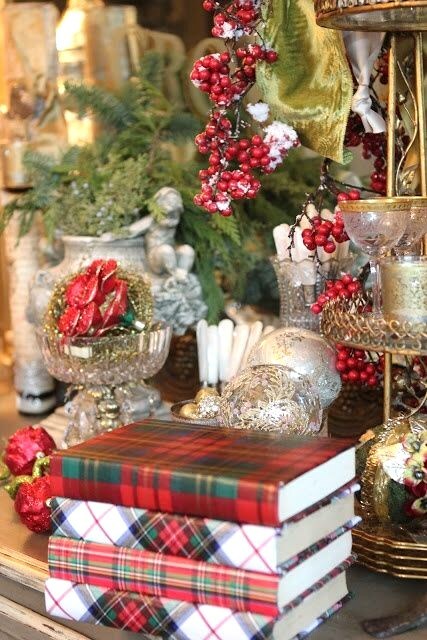 It's timeless and plaid really is a perfect way to decorate for Christmas. 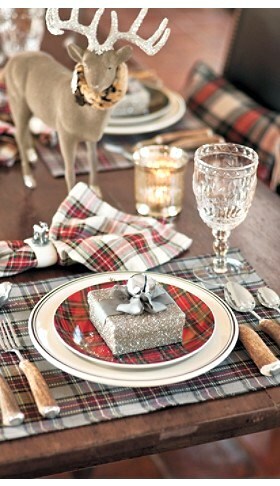 I love tartans and most plaids in the fall and winter. 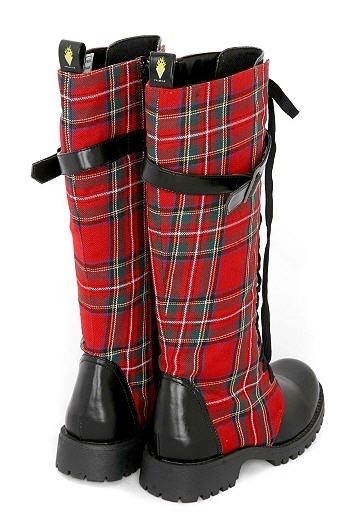 I think it might harken back to school days of plaid dresses in elem school and then wool plaid skirts in high schoolers! Ha. 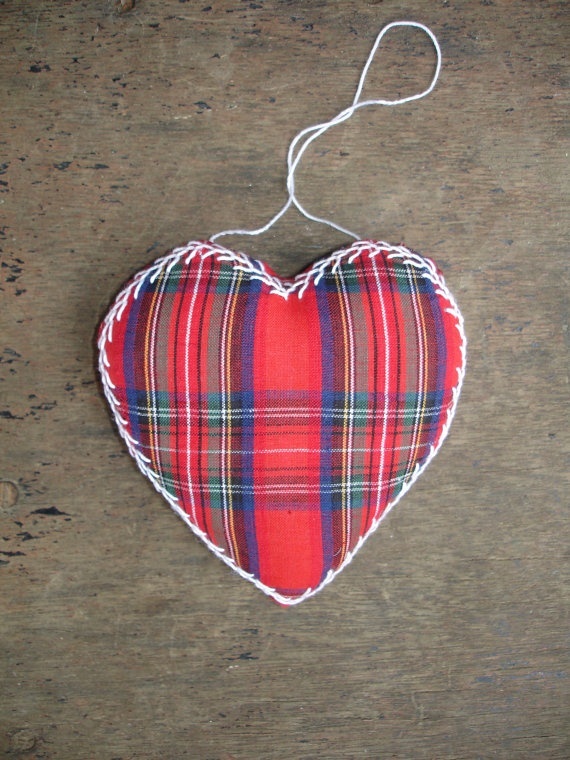 We gave a clan tartan....but not bright enough to use for Christmas...so I go for the Reds like you have shown. 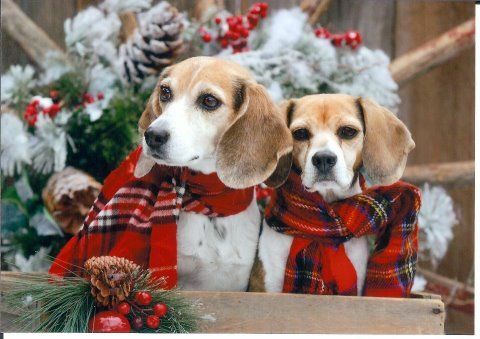 All pics are great...but the puppies with their plans scarves melt my eart the most. This our first Christmas without our furbaby, a golden who sported red kerchiefs at Christmas time. Love all the ways you styled plaid, and all the patterns you added to it! I'm another person doing plaid this year but I was wanting a blue based plaid....and couldn't find it anywhere! 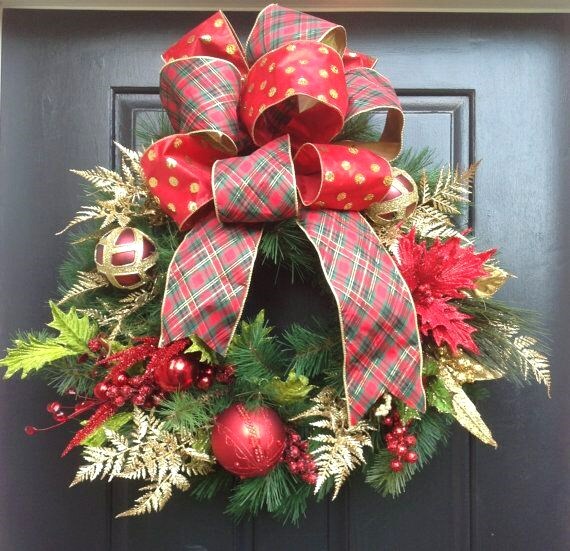 I finally got some through Ballard designs, who knew it would be so hard! Beautiful, beautiful plaids! 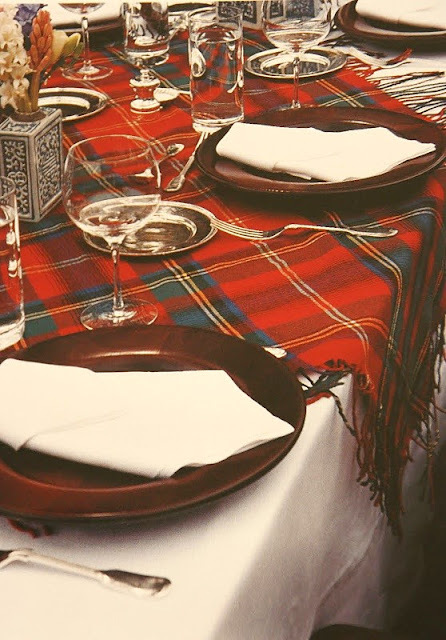 The Oliver Clan Tartan is very handsome. 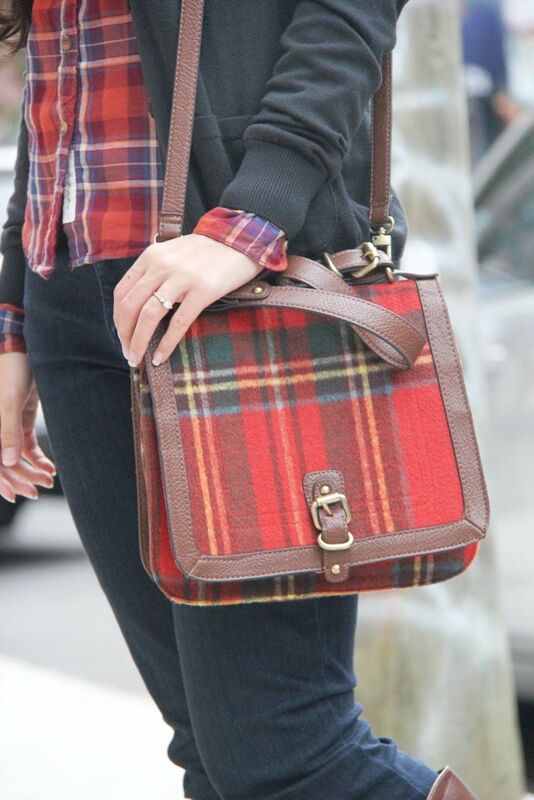 I love plaid as much as you do! 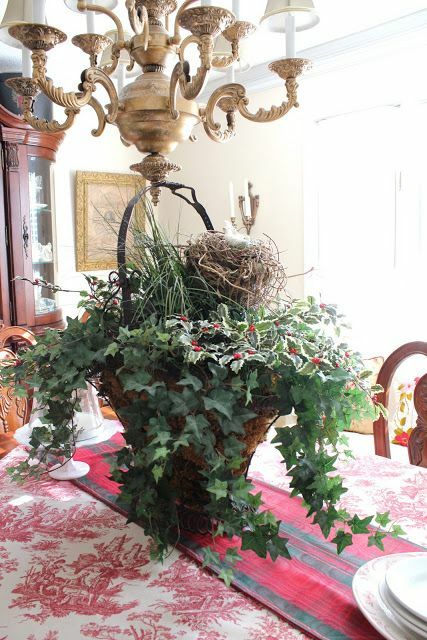 My Mom used it a lot to in her holiday decor! I always use it every Christmas season, Thanks for so much inspiration. 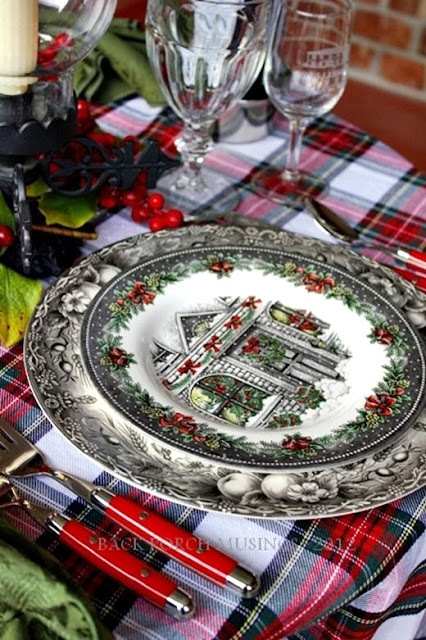 I want some of the little antlers like the ones shown in the dish. I love the look but unfortunately don't know where to find them. 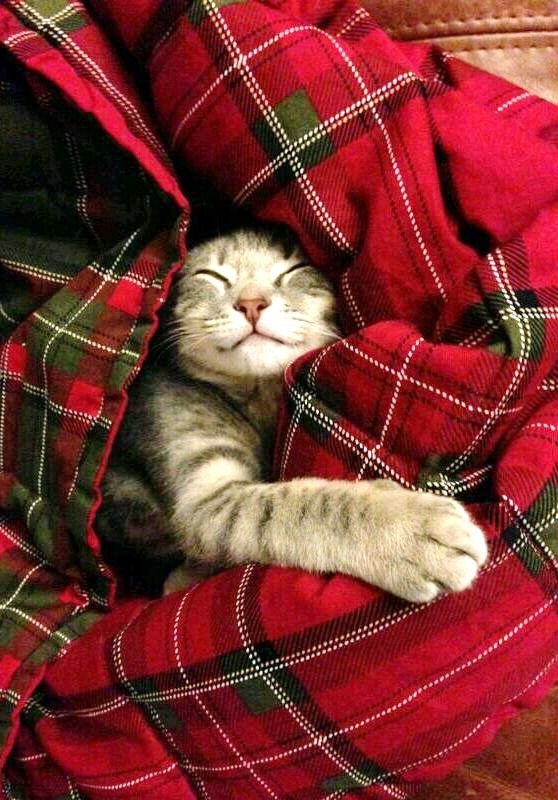 Debra, I'm made for plaid, too! Any time of year. Now that I think of it, all my favorite school clothes K-12 were plaid, most often red plaid. 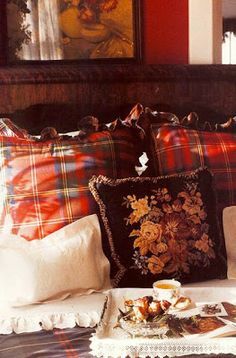 I love plaid, too...love all of these wonderful inspiration photos! I love all of these pics. 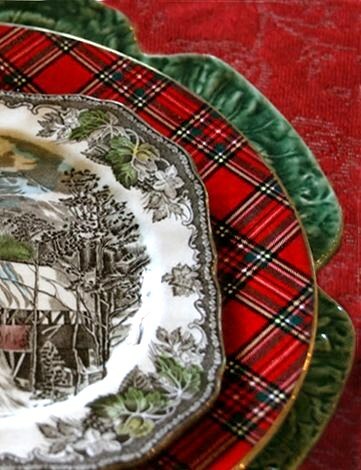 Over the last month I've been collecting plaid items for a tablescape, lots of inspiration here thank you. 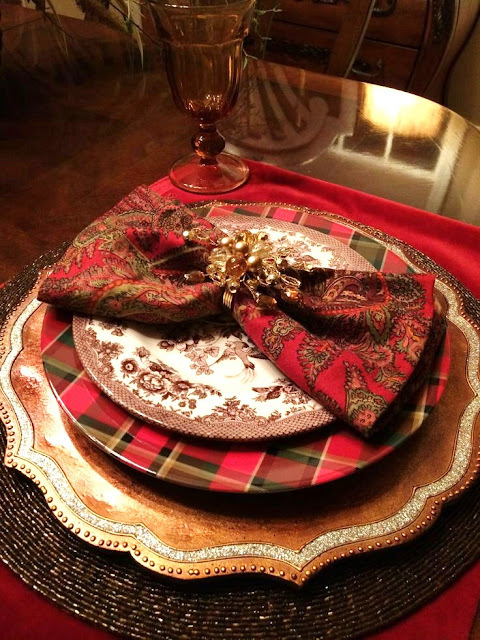 I used a vintage red plaid tablecloth for the Christmas Tablescape in the Family Room, dear friend!!! 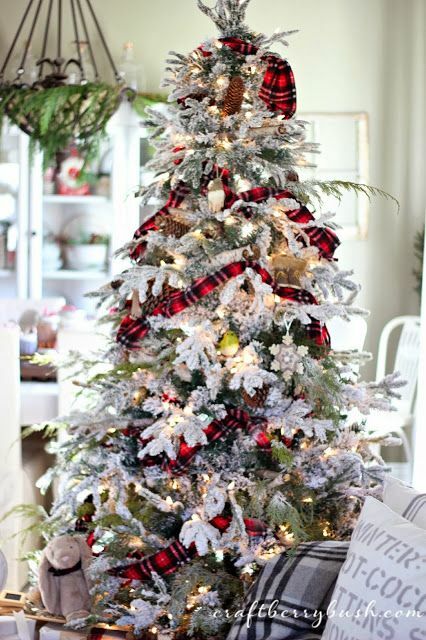 Many years ago, I did a whole Christmas Tree in red Tartan plaid bows, brown wooden beads and hand painted ducks for "Mr. Ed'!!! 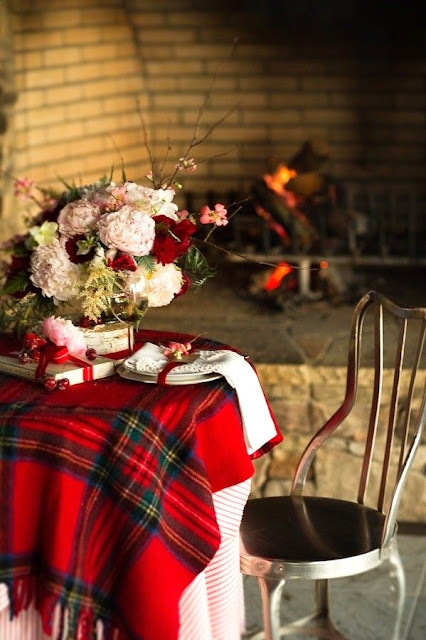 Love seeing a Back Porch Musing Tartan plaid tablescape among your inspiring photos!!! 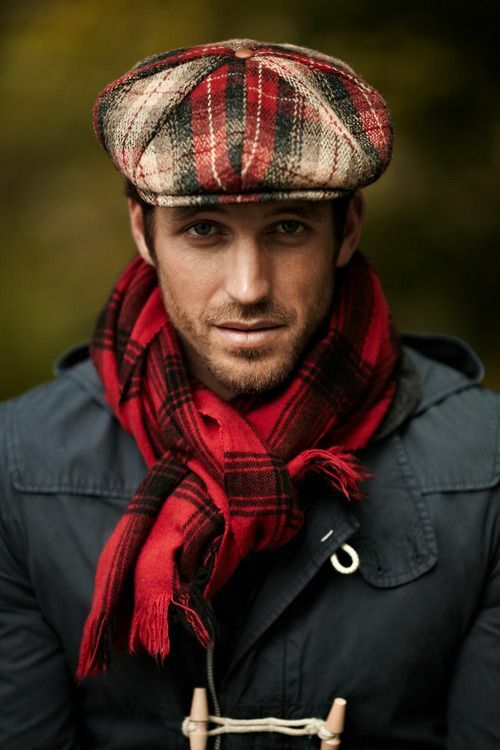 Debra, I have been playing with plaid all day today. 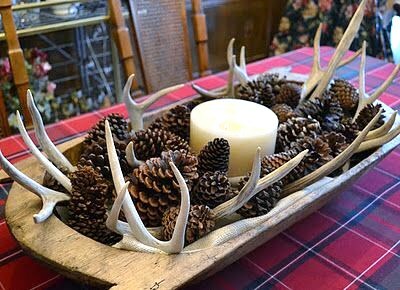 Decorated my mantle and table with plaid. I bought some papers to wrap a few of my books, but haven't done it yet. Love all of your inspirational photos! 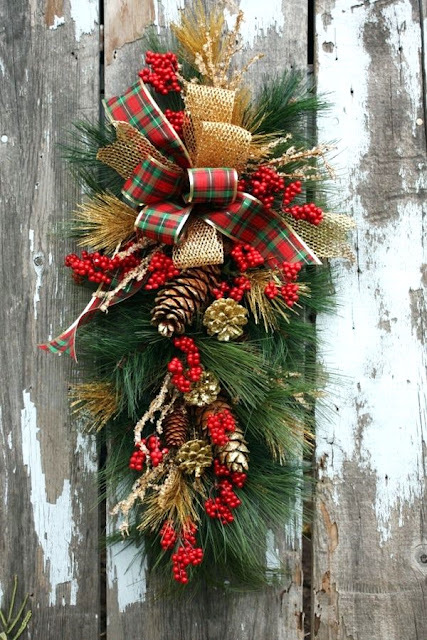 Hi Debra, so mich plaid to aspire by. 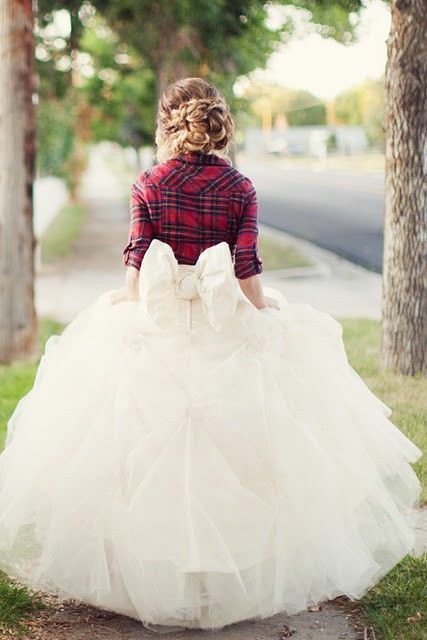 Love the formal informal wedding gown with the tartan top. So much beauty, as for tartan i know this to be a favorite of yours from past years, it's always such a beautiful Christmas here with you Debra. A favorite of mine is your cement statue of hours, I too have had my eye open for a stone statue, perhaps a vintage looking dove. 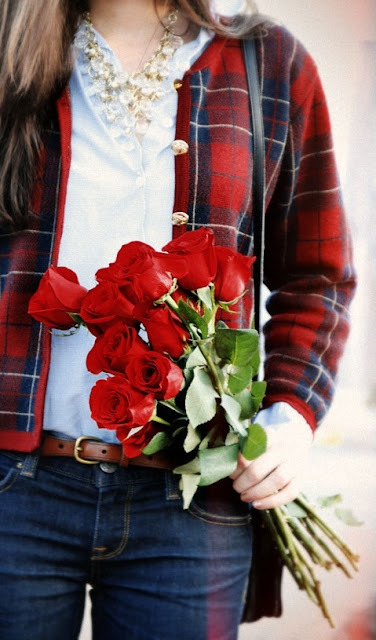 See you and all your plaid soon.